I have a habit—good or bad, I’m not sure which—of signing up for physical challenges and then ruing the moment I did. I worry about the event. My neurosis surfaces from deep in my genes and whispers annoyingly, “Why did I say I’d do this? I could stay in bed and read a good book.” Then I get started, and remember why: I like to try new things. There was trapeze school on the Santa Monica pier with the kids in 2011. The bike trip through Vietnam later that same year. 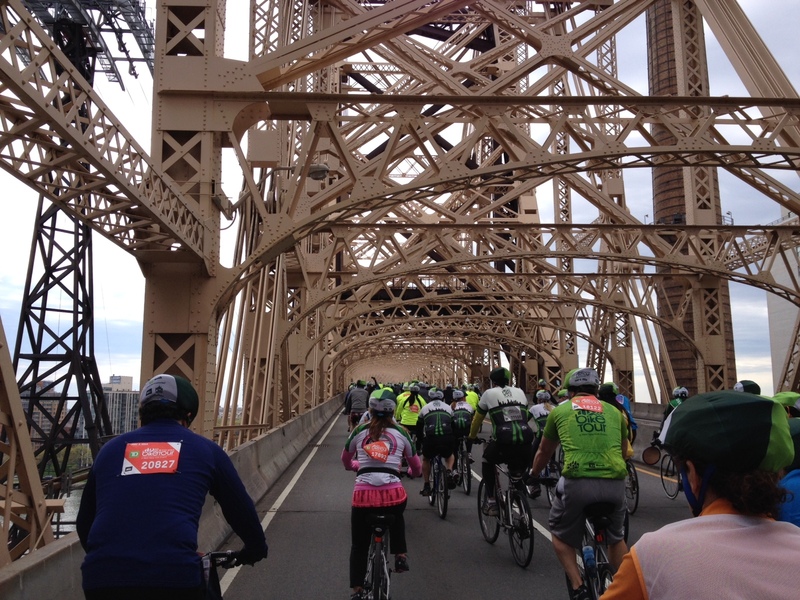 And now the 5-Borough Bike Ride, with Bob, friends from Florida, and 35,000 others on May 4, 2014. 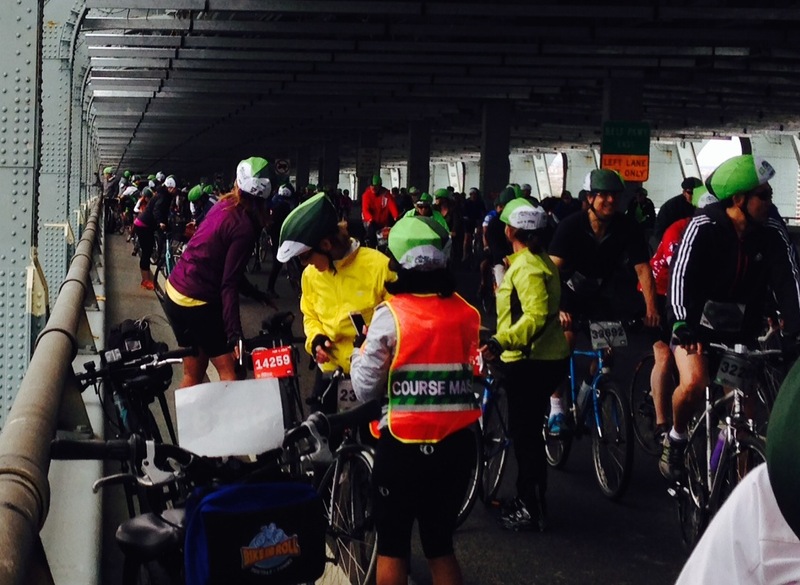 There were times when I found the 40 mile ride exhilarating, just seeing the number of riders at the start. The sea of helmets in the photo below is only about 15% of the 32,000, because we were half-way down the pack and there were three different start times. 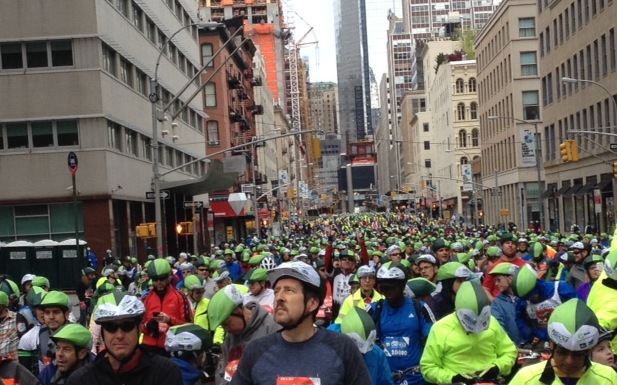 At times the ride reminded me of the Running of the Bulls–exciting, fast, crowded, and a little bit dangerous. 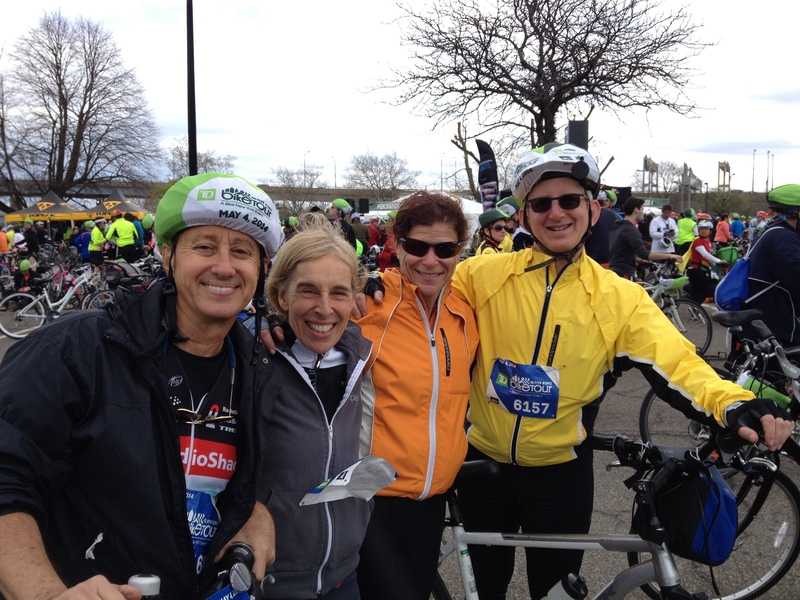 At the end: That great feeling of accomplishment and fun you get when doing something new with friends and a 50-something body. 1 . The Verrazano-Narrows Bridge is 4 miles long, which means 2 miles up and 2 miles down. The V-N was the last of five bridges on the ride. It has a very gentle but long uphill (which stopped some folks). Then we coasted (“Woo! Hoo!”) two miles down to the end. 2. There is more than one kind of Kind bar. Kind bars sponsored the ride and gave them out at rest stops like it was Halloween and everyone was wearing a cyclist costume. Kind bars look to me like nuts glued together with some sort of goop. Healthy goop, of course. But the Kind Bars folks also gave out a grain-only bar at the first rest stop. That’s the kind of bar I liked much more. 3. Defensive biking skills are helpful and rare. I’m a little nutsy about following safe biking rules. They may be the only rules I love. I wear a mirror on my helmet, and look at it every 2 seconds. When I’m passing, I say, “passing on your left,” or “coming up on your right.” When I slowed down I said I was “slowing” (there’s no brake lights!) To people who gave me the same helpful signals, I always said “thank you” to the back of their head as they whizzed by. 4. New Yorkers can be very cool about being crowded and waiting. 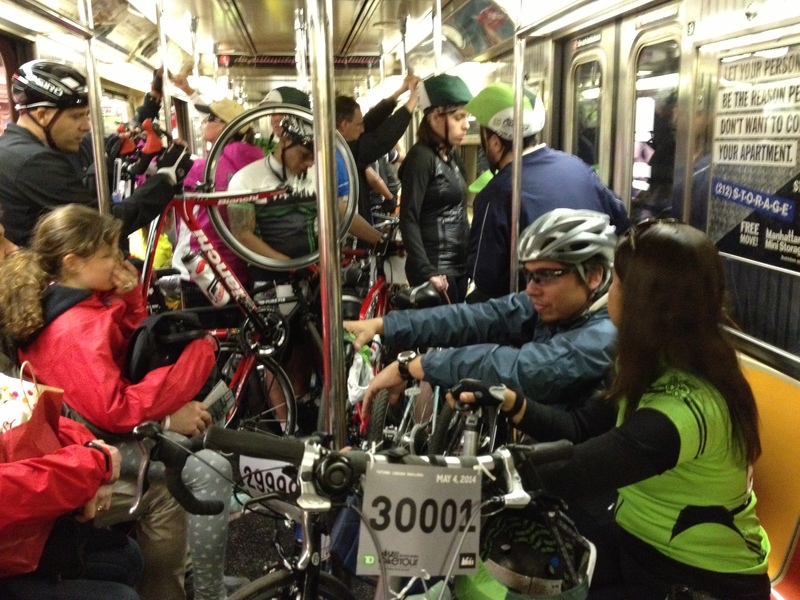 There were long lines for the bathrooms, the ferry, and food, as well as subways crowded with bikers, but I didn’t hear one grumpy or offensive person. Yay NYC! 5. Uncle Junior from the Sopranos (aka Dominic Chianese) has a great voice. He sang the Star-Spangled Banner at the starting point. Thank you to our friends who invited us, our cousins who fed and housed us, and to Bob, who loves these adventures too, but skips the neurotic worrying before. 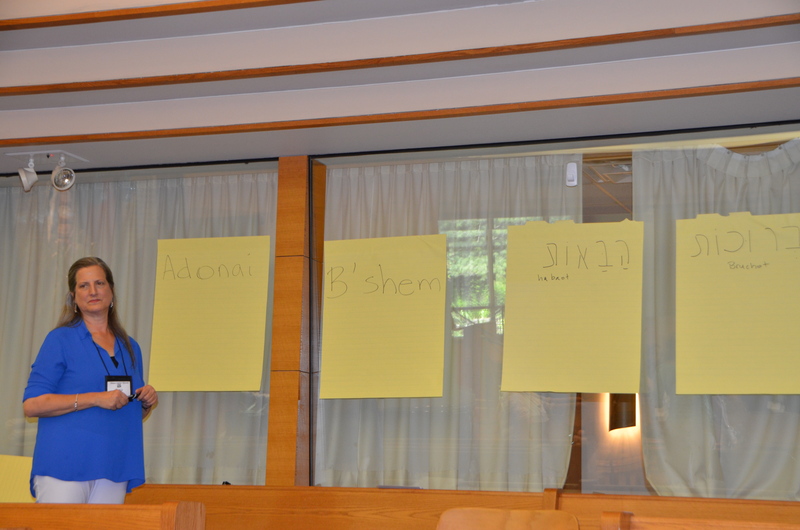 On June 17, 2013, I had the honor of working with 60 female Jewish cantors at their annual Women’s Cantor Network conference in Ann Arbor, Michigan. 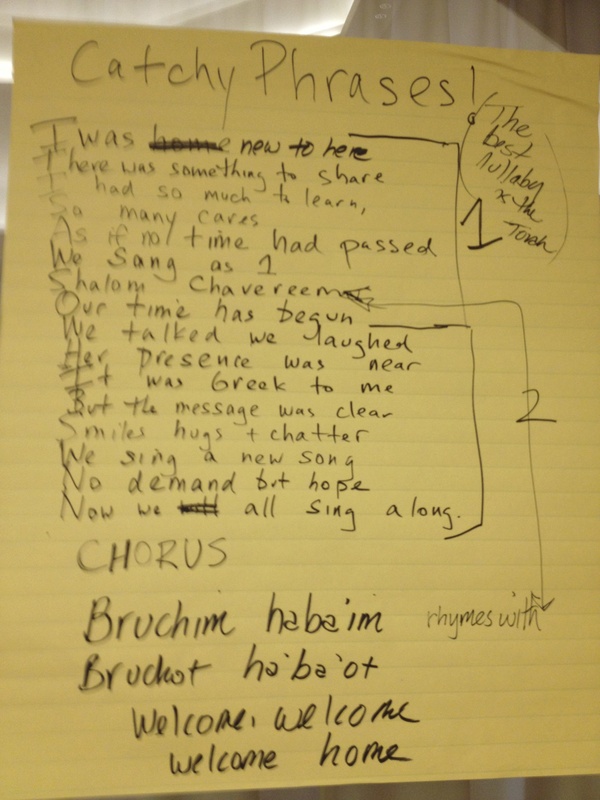 Our challenge: write a song in two hours. A song by sixty women musicians? I don’t know even two women who can agree on the same type of coffee to order in Starbucks! 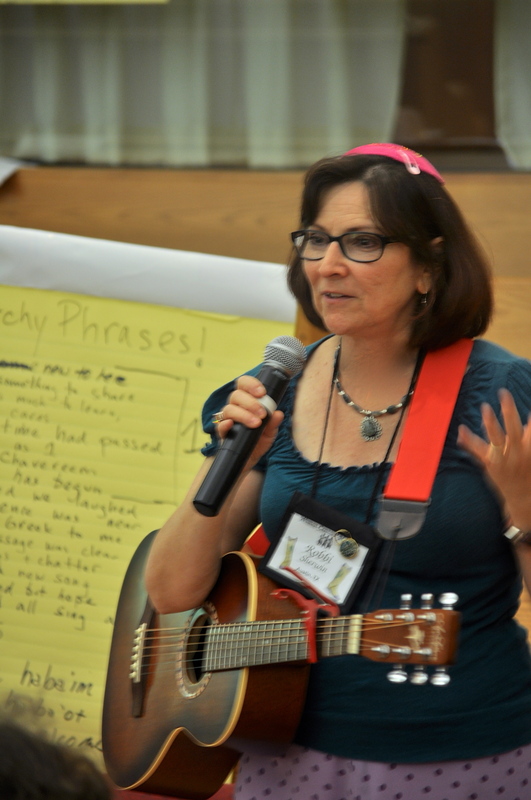 But I had a secret weapon: Jewish Rock Star Robbi Sherwin as my co-leader for the songwriting workshop. She’s done this dozens of times–but in a weekend, not in two hours. However, Robbi and I both idle at the same speed– hyper fast, maybe a teensy bit slightly nutsy fast. We prepared during three one-hour skype meetings. We had wall boards, 3 x 5 cards, markers. And Cantor Extraordinaire Annie Rose was there helping. What could go wrong? –I remember a time when I felt welcomed by friends, family or colleagues. 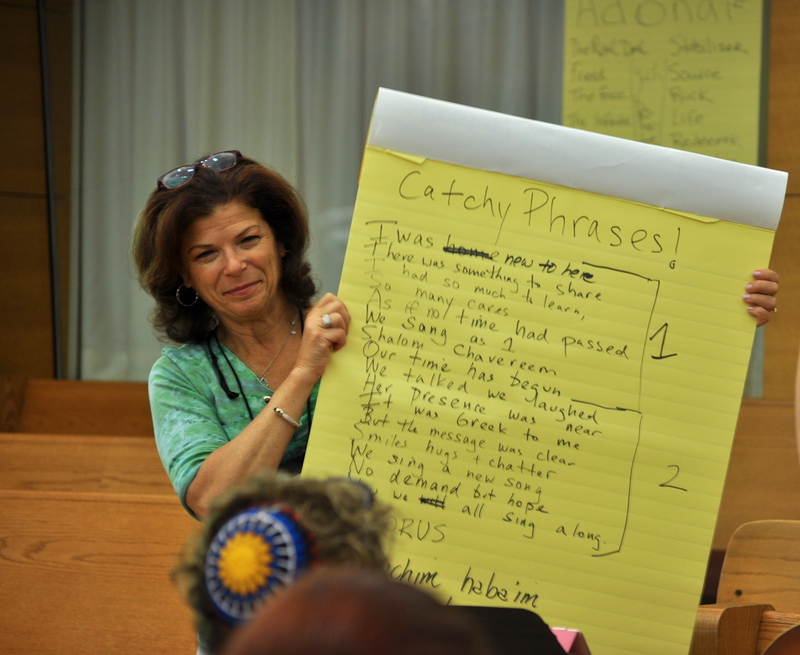 I taught everyone how to recall catchy phrases as nonjudgmental feedback, they wrote down the phrases on 3 x 5 cards in small groups, we collected the cards, and then Robbi and I collected choice phrases into a song. The words are below. Robbi spent time after the break discussing what the song would sound like, and came up with a fabulous melody. This blog isn’t happy about playing the MP4 song here–but I know Robbi has recorded it, and it’s an amazing song, written by amazing women. Lucky me to be with them for a day. If you see an ad below, it’s because I haven’t purchased the “no ads upgrade” which I just heard about. That’s how they getcha. If you are interested in more information, check out my new class, Publish Your Own Ebook. As easy as we hear it is to publish an eBook, you still have to know how. Here’s how in three steps. Final blog posts: How to convert your content to be readable on the kindle. A computer with internet connection. For the minute, we are going to assume that you have a document that is correctly formatted for the Kindle. That assumption may be incorrect, but don’t worry. We will cover how to correctly format your eBook in a future blog post. 1. Go to kdp.amazon.com. You’ll see: Welcome to Amazon’s Kindle Direct Publishing. 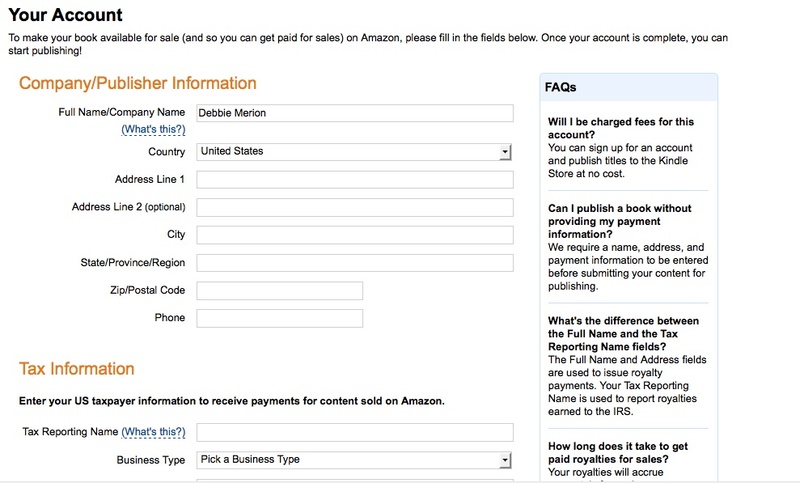 If you already have an Amazon account, you can sign in. However, even if you have one as a reader, you might want to set up a separate account for the books you will publish, using a different email address. 2. To set up a new account on amazon, sign out, and then you will see: Sign up. Click on that. 3. On the next screen, enter the email address you will use for your publishing account, and click “I am a new customer”. A new screen appears. 4. Enter your name and password and click Create Account. Here are the screens you will need to complete to finish creating your account. We will go through each item below. I have joined the Solsticehood. We are a select group of dedicated, passionate, inquisitive, supportive, tolerant people who are crazy enough to think they have something to say. Our amazing director is Meg Kearney, Townie author (and hottie) Andre Dubus III taught a fabulous class in January. For now, I’ll just let the video below talk for me. I think I’m in it, but I’m not sure, what do you think? If you are like me, your weekends are precious. They are my time to be lazy and relax, then get off the sofa and straighten up the mess from the week, and get out of the house to exercise and socialize. In short, time to recharge my batteries and maintain my life. 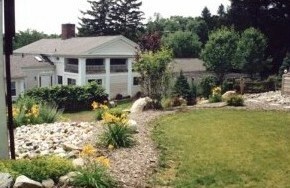 I’m excited to be a part of this upcoming retreat on Sept 16-18, 2011 at the Windrise Retreat Center in Metamora, Michigan with master coach Susan Rothfuss. I am amazed by Susan’s clarity, positive outlook, intuitive ability to understand people, kindness, and desire to help others move into a better future for themselves. I always feel good just being around her. I’m honored that Susan asked me to lead the writing aspect of the retreat. I am planning that the writing will be as fun and informative as it is easy. As Susan says, this writing aspect of the retreat is perfect for everyone, even people who dread writing a thank-you note. Please join us! The registration form is here. To find out more, give Susan a call at 248-295-2536, or call me at 734-646-5985. If you’ve been looking for a way to do something good for yourself, this is it. screen, with dinner from gourmet food trucks. biking. I’ve always been able to hang with my hands. Hanging turned out to be the least of my problems. Little did I know this would be a lesson in LETTING GO!! Here is the picture book I made of my experience. 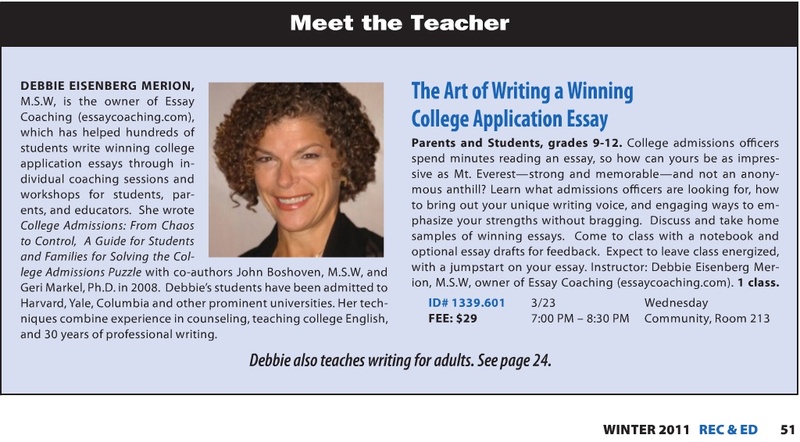 Two March 2011 classes by Debbie Merion, M.S.W. To register, call 734-994-2300 ext. 53203 or visit Ann Arbor Rec and Ed. On December 2, 2010 at our Ann Arbor Toastmasters and Friends meeting, Debbie Merion urged everyone to vote with their feet for Lori Harris, who was sitting quietly in the last row of the meeting. We couldn’t vote for her for Toastmaster of the Year—an award she had recently won—but we could vote for her as “Queen of the Day” with a rousing standing ovation. Debbie was urging on her fellow toastmasters while delivering a persuasive speech for the Competent Communicator manual, so a little proof was in order. What had Lori actually done? 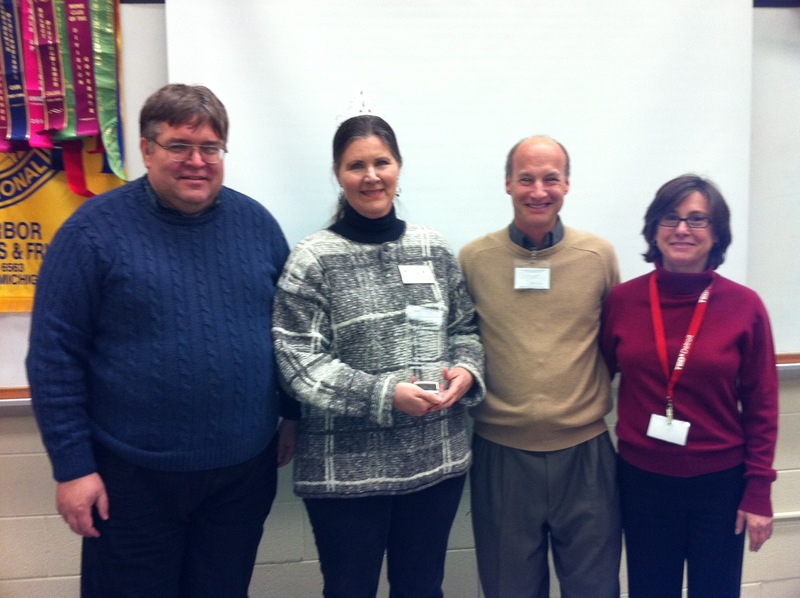 To receive the Toastmaster of the Year award, Lori had actually been recognized as having the year’s most valuable contribution to District 28, which includes parts of Michigan, Ohio and Ontario. Lori formatted and distributed multiple directories of officers and members, not a small task for a huge district that includes 120 clubs, 700 officers, and over 2,000 members. But that’s not all. For the last two years, she had been instrumental in creating the printed programs for the District 28 conference, and this year saved the district $500 by getting an excellent printing quote. No small chunk of change! There’s more. She also created the “First-Timers” manual for all who attend the District 28 Conference, based on helping others avoid replicating her own –“less than optimal” first-time experiences. As she recounted, at her first district 28 conference Lori was twice in severe danger of being arrested by the fashion police –once for wearing business attire when others wore casual clothes, then switching to casual clothes the next day only to find that people were spiffed up in their business best! 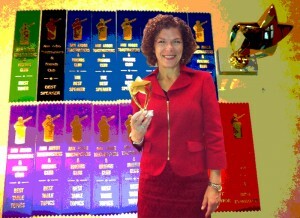 Lori hadn’t been able to make it to the District 28 meeting last month to receive her award, so after Debbie persuaded everyone to vote with their feet with a standing ovation for Lori, Lori came up to the front of the meeting and was crowned “Queen of the Day” at Ann Arbor Friends and Toastmasters, and also received her lovely “Toastmaster of the Year” award by Collyer Smith (Division C Governor), Kevin Olmsted (Area 13 Governor), and Annie Wolock (Club President). The meeting became a festival perfect for a queen. In our seven-minute intermission, chocolate cake was served, and then Table Topics provided all members with an opportunity to share their insights on success and personal bests. 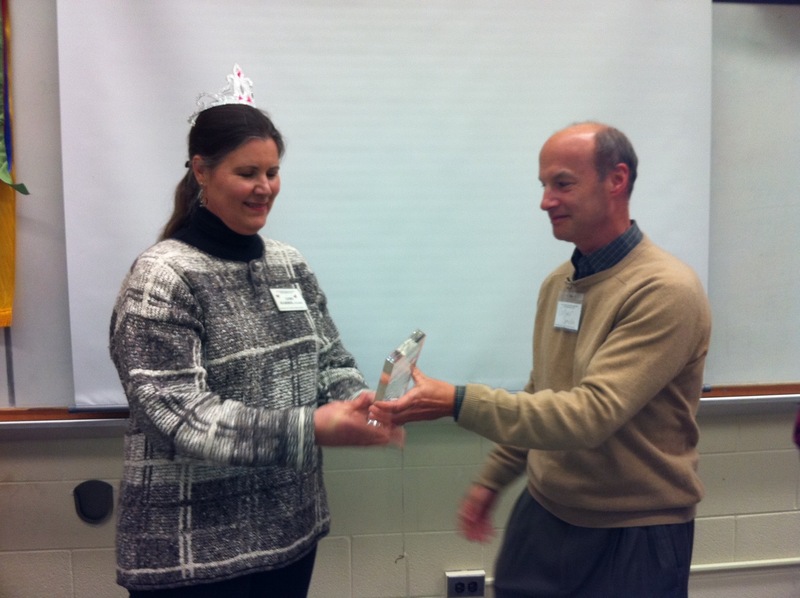 Each toastmaster addressed their fellow toastmasters, honored guests (including Collyer Smith (Division C Governor), Kevin Olmsted (Area 13 Governor) and Mayna Shumacher of the Washtenaw Toastmasters Club) and of course, her royal highness. Lori was delighted and surprised to be the focus of the meeting gala and a perfect queen: humble, exemplary and inspiring. “Let them eat cake,” she said, and brought home leftover chocolate cake and her crown to happily share with her daughter. Members went home exhilarated, and slightly sugar buzzed.